What is perspective in art? It’s a method of creating the illusion of depth and space on a flat surface and there are several types of perspective in art that can be used. Sounds easy, right? Maybe. For some of us, we need a bit more detail. A simple explanation of the perspective drawing definition is this: things seem to get smaller as they get further away. What is linear perspective in art? It’s the geometric technique used to show the diminishing of scale as the distance between the 2D object and viewer increases. When creating one-point perspective drawings, the horizon line has only one vanishing point. Learning how to draw a road going into the distance uses this technique. Two-point perspective drawing uses linear lines moving towards two opposite vanishing points. This gives the illusion of a 3D space on a flat 2D surface. Drawing in three-point perspective lets the viewer see two sides of an object as well as the top or bottom at the same time. Lucky for us, there are experts who make this stuff a bit easier to understand. With examples, demos, and easily understood instructions, the right guidebook is a wonderful teaching tool. Drawing in perspective makes your sketches come to life. They look realistic and believable. Da Vinci, Brunelleschi, and Piero Della Francesca became masters of linear perspective. Having your own comprehensive book lets you study and learn at your own pace. If you’ve ever thought about drawing, try one of these books to get you started. Heavy with illustrations, this book gives you a guided tour of perspective concepts thoroughly supported with necessary visual aids. It’s not always easy to explain perspective drawing through text alone. Almost 90% of the book is made up of images to help you understand the text. Learn how to construct perspective views using elevation, slopes, and geometric tools. Use circles, curves, and squares as tools to determine the type of perspective you’re trying to accomplish. An appendix gives a four-step breakdown of drawing examples that outline how to draw different types of perspective in art. Students of art, interior design, and architecture learn how to use the most current styles of how to develop perspective views one step at a time. Packed with supplemental tutorials, all topics discussed in the book are comprehensively taught via video. For any skill level, it’s a valuable reference tool to refresh or hone your existing skills. There are various types of perspective in art. 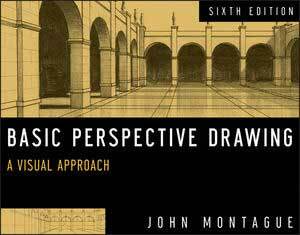 This book starts from ground zero to explain basic terms and principles of perspective drawing. You’ll learn to think like an architect to shrink what you see and transfer it to flat paper. Draw buildings by using basic shapes, add layers and finish it with details and coloring. Spatial principles and layering are discussed in simple terms. Multiple drawings are deconstructed to show you exactly how they were created. Have you ever wondered what a vanishing point or an eye-level line is? This book explains it while breaking it down in a real sketch for visual understanding. 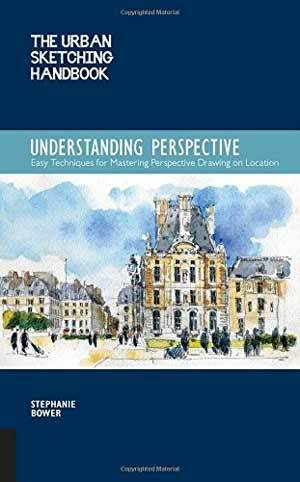 If you’ve ever wished you could create landscapes or create buildings drawn in perspective, this book will teach you how in easy to understand concepts and terminology. 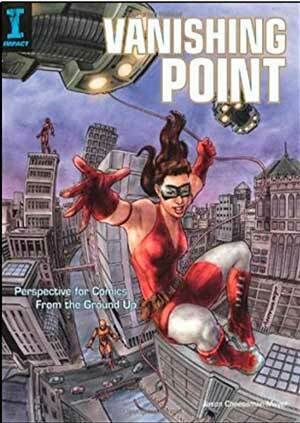 There are many uses of perspective drawing, and comic illustrations is an interesting one. Comic artists need to create the perspective from a concept since they can’t usually observe the world they are trying to create. Build your skills not only with 1 pt perspective drawings but grasp a greater understanding of 2pt perspective drawing as well. After that, move on to 4- and 5-point curvilinear perspective where straight lines are drawn as curves. A full chapter is dedicated to drawing curves rather than boxes, squares, or straight lines. Start drawing cylinders, cars, and people – all in perspective. Geared towards comic artists, this book teaches how to translate technical perspective techniques into comic illustrations. Basic steps are outlined for beginners, but things move quickly to the advanced perspective drawing techniques. Full-color drawings show (and discuss) the features, techniques, and ways to capture the exact perspective you’re looking for. How do you sketch your living room in a way that makes it interesting? By making it look realistic with depth and scale. This book starts off teaching the basic types of perspective in art, like depth and scale, then moves to the advanced techniques. Slopes, tilts, circles, and cylinders are explained, then demonstrated. It helps you master 1 pt perspective drawings so you can move onto two- and three-point perspective. Learn how to draw animals and people so they look realistic. Once you learn a technique, practical shortcuts are shown. Twenty-five step-by-step demos show how to draw a basic room, landscapes with depth, cars, and 3-D lettering. Create an entire city with people and buildings drawn in perspective that jump off the page. Learn how to turn a flat drawing surface into a three-dimensional wonderland with this guidebook. The essential techniques are taught with supporting visuals to show step-by-step instructions. All skill levels can learn something from this author. This book details how to use different types of perspective in art to create stairways, reflections, and mountains. How to draw a road going into the distance can be mastered with a few shortcuts. Buildings drawn in perspective will look amazingly realistic after you follow the author’s technique. It starts off simple then progresses to more challenging linear perspective methods. Tone, placement, spacing, and size are covered to give you a solid foundation. Angles, shadows, and light reflection are extraordinarily lifelike as you learn. Multiple diagrams, color photos, and paintings are used as examples to explain each step. It’s a valuable beginner’s tool for any art student or someone who wants to learn on their own. 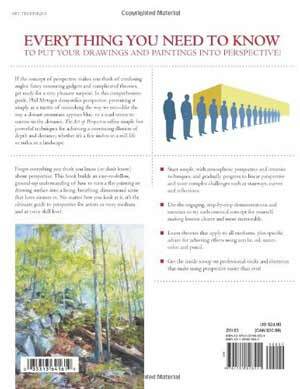 Learn the types of perspective in art – which guidebook is right for you? To explain perspective drawing in the simplest terms is to say that it mimics the way we see things. It just puts it on a flat surface. Transferring the three-dimensional world onto a two-dimensional piece of paper takes some practice. 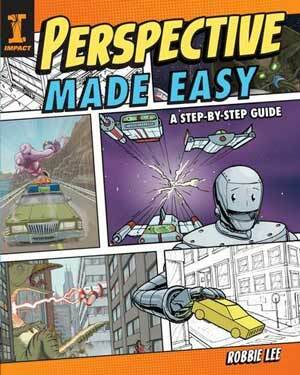 Learn the basics with Perspective Made Easy: A Step-by-Step Guide. For someone who’s never drawn a straight line before, this builds your skill from the ground up without overwhelming or confusing you. 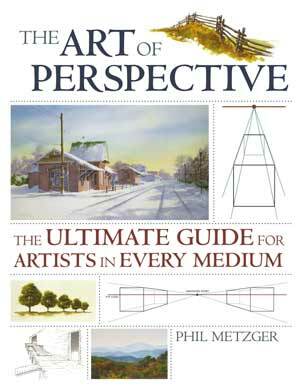 If you have a bit of foreknowledge of drawing but need to start over, try The Art of Perspective: The Ultimate Guide for Artists in Every Medium. The basics are covered for the beginner to give you a firm grasp on perspective concepts. Progress steadily onward to complex techniques including linear perspective methodologies. Drawing is a phenomenal hobby with beautiful results. Stop wishing you knew how to draw. Choose a book and learn how to make your pencil bring your imagination to life.